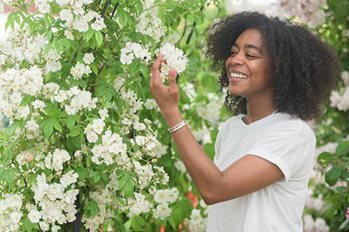 Five budding young designers threw their heart and soul into bringing their designs to life at the RHS Flower Show Tatton Park 2018, after being tasked to create a garden that highlighted the health benefits of plants and gardening in the 10th edition of the RHS Young Designer Competition. After being scrutinised by the judges at the show, Will Williams with his garden, At One, was chosen as the winner in the competition that has seen previous finalists go on to design gardens for top shows and exhibits, including the RHS Chelsea Flower Show. Will's garden was designed with both the health of people and wildlife in mind, initially being designed as a relaxing space for a professional couple. "I wanted to create a garden that was both functional for the the user and beneficial to wildlife," explains Will. "For example, the plant choices used in the garden interact with different sets of wildlife. There's a variety of pollinator-friendly plants, including Verbena and Hydrangea, as well as insect hotels that have been built into the wall of the garden." With bees and butterflies buzzing all over his garden, Will won over the wildlife (as well as the judges) at Tatton Park and pipped his fellow finalists to the title, having been mentored for the competition by internationally-acclaimed landscape designer Paul Hervey-Brookes. See Will's garden in full and watch him describe his design. Jimmy McAdam, 24, from Nottinghamshire staged a beehive as the central focal point of his Born to Bee Wild garden, which featured wildflowers and plants from the RHS’s Plants for Pollinators scheme. Key bee-friendly plants included Lavandula angustifolia ‘Hidcote,’ Leucanthemum vulgare and Armeria maritima. "It's been a good experience as my first show garden," says Jimmy. "I've learnt a lot and made some good contacts. On the whole, it's gone quite smoothly, but the heat has been a challenge. With the pond, we were trying to paint it to give it a smooth finish, but it was going off. We had to try and come in earlier in the morning when it was cooler." Eds Higgins, 28, is from Norfolk but based in Nottingham. His design, Finding [urban] Nature, celebrated the hidden charm of wasteland and inspired visitors to see these spaces as important urban ares for wildlife. Key plants included Buddleja davidii, Prunus serrula multi-stemmed and Erigeron karvinskianus, as well as vegetable plants and wasteland natives. It also featured a community allotment. Eds says: “My garden has been inspired by brownfield sites, with this one based on a space in Nottingham that has been left as wasteland. It's become an unofficial wilderness and I wanted to recreate it here to show how important these spaces can be for pollinators. "The build went well. The biggest technical challenge was the planting. I wanted to use plants that you'd see on a wasteland, i.e. ones that aren't perfect and typical of a show garden. It was quite difficult to source these, but it all came together in the end." Nicola Oakey, also 28, based her design, Raised by Rivers around the calming effects that being beside water can have. The aspiring designer, now living in Lincolnshire, used a large oak deck overlooking a body of water as a comfortable seating area in her garden. "I wanted there to be interaction between the user and the water in my garden," says Nicola "Lots of people have ponds in their garden, but nowhere to sit around and actually enjoy the water. Raised by Rivers invites you to sit and spend time close to the water, while the nearby water feature also provides a calming sound. "While it's the central focus of the garden, the oak deck has also been the biggest challenge. It was pre-built before the show and the oak was very green. It had since been sat in the heat and the boards had shrunk because all the moisture had dried out. We had to pretty much start from scratch. Luckily I had a very good carpenter to help!" Max Harriman, 26, from London created a space to escape the stresses associated with urban living with his Calm in Chaos garden. With a weaving path throughout the garden, Calm in Chaos encouraged the user to become completely lost and immersed within the space, leaving their cares and worries behind. "I wanted to create a garden that keeps the guest in for as long as possible and maximises the restorative benefits of green space," says Max. "As you follow the path throughout, the views and textures change, enticing the user to explore and go further into the garden. "Keeping all the plants at their best has been difficult. The heat has been horrendous and I'd accounted for typical wet Manchester weather! The ferns have suffered and become heat scorched and with 2,600 plants, it's been a challenge to water them all."